Since it began back in the 1940s, Sky Manor Airport has served both local and transient pilots. From its humble grass-strip beginnings to the current 2900-foot paved runway, Sky Manor has been a favorite stopping point for pilots. (read more) Sky Manor Airport is just a half-dozen or so miles from the historic Delaware River with its quaint river towns. For those seeking a bargain, the Flemington Shopping District with numerous shops, outlets, and auto dealers is just around the corner. 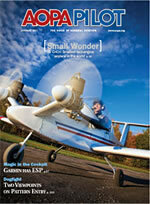 Li’l Airport Makes Spash in 1977 Flying Magazine Feature Story! These Airport Diners in New Jersey have the Best Breakfasts! 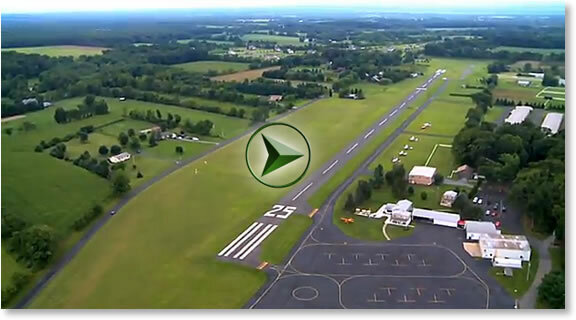 A jewel of an airport that remains rural, scenic, and private – Sky Manor Airport is just an hour or so from both New York City and Philadelphia. An easy commute with the commuter rail station a short drive away. While most of you made yourselves ready to help our economy this early AM I elected to continue exploiting my second retirement :-) and take to the skys around Sky Manor while Ellen took videos and pictures from the back seat of my contraption. In short – it was a beautiful morning to chase our shadow as you'll see. I've taken the liberty of attaching a short video of our departure with the intent on posting more of what we saw in the near future.